Our swimming pool grating is proudly Australian made, using the highest quality materials, made here with finishes that will withstand the harsh chemicals found in pools, so you can enjoy your swimming pool grates for many years without needing to worry about replacing them anytime soon. Stainless steel grating is lightweight, making the drain grate easy to remove, and the cleaning simple. Leaves and debris are easily flushed away thanks to increased skimming performance so that you can enjoy a clean environment. 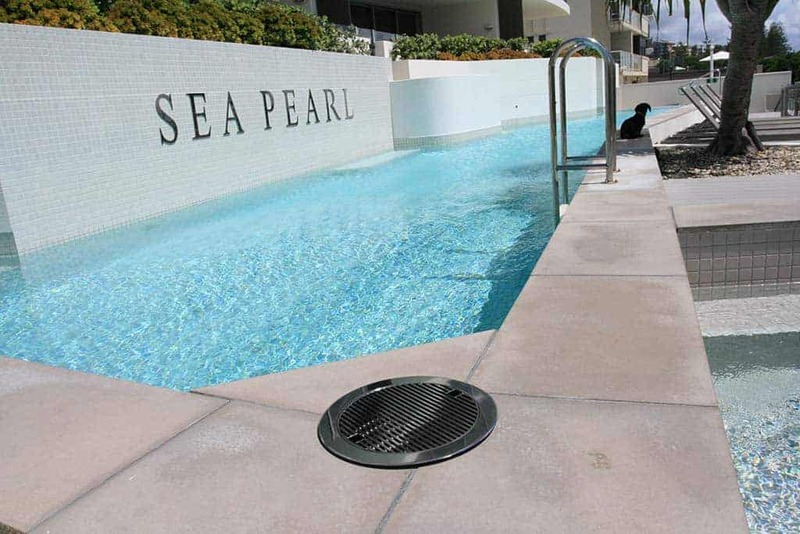 Every aspect of our pool deck drain covers have been carefully engineered to offer maximum effectiveness, no matter what type of location you use it in. Maintain an elegant look in your pool or spa area with a sustainable design, that creates a safe and clean environment for you and your guests. Our deck drain systems have been developed to be both highly functional and attractive. With our pool deck drain covers, you can get the best of both worlds. Auswave Products’ stainless steel pool grates allow you to seamlessly blend your swimming pool grating system into the surrounding architecture, while maintaining high efficiency and getting maximum surface water drainage. Our pool grating uses high grade stainless steel, built to last, and made to suit all sizes and even colours. Whether you have a curved or rectangular swimming pool, we can customize our grates and trench drains to suit the location perfectly. Whether you are currently building a new pool or just renovating your existing one, our drainage systems can provide the perfect finishing touch. Our deck drains come in a variety of sizes, and can be used for both straight or contoured shaped pools. In either case, our drain covers keep the surrounding areas dry and safe. They are also incredibly easy to install and customize, featuring modular, interlocking pieces of grate, meaning, you can get precisely the look you are after with minimal effort. If you are concerned with the visual appeal of your drain grates, then you need not be with our carefully crafted grates – see our gold plated grates for example. They are built to offer maximum appeal for a luxury setting, helping you create a, clean and safe, oasis! These cost effective pool trench drain solutions have been specifically designed to hold up against aggressive water conditions, so that you can expect long-lasting performance at a reasonable price. If you require high capacity drainage, we even offer uniques varieties for such applications. Simply get in touch with our team, who can advise you on which system would best suit your needs. We will gladly discuss your unique project with you in further detail so that you can get the very best outcome for your new construction. Outdoor drain covers for your swimming pool drain help to create a safe environment around swimming pools, aquatic facilities, spas, changing rooms and water parks. With a specially designed permanent slip-resistant surface, you won’t have to worry about others slipping over and injuring themselves while any water is safely drained away. Our pool grating has been designed to offer safety, as well as comfort, even for bare feet. They never need refinishing and are completely safe and non-toxic. You can rest assured that you are providing the absolute best facilities for your guests. Purchase our premium pool drain grates that offer functionality, as well as a luxurious feel, around any water feature. We install our drains so that they end up level with the ground: you will hardly notice their presence. Functionally speaking, the drainpipe still has sufficient fall, so it is self-cleaning, offering maximum efficiency. For Pool Drain Grate Installation, Call Us! If you would like to learn more about our pool wet deck grating, simply get in touch. We are more than happy to provide detailed information about our grating systems and how we can customize them for your environment. From swimming pools to athletic facilities and water features, our deck grates for drainage can be completely tailored to suit your needs.